English for Specific Purposes (ESP) is now well established as an important and distinctive part of English Language Teaching. Since the late 1980's ESP has changed in two very significant respects. Firstly, English for Business Purposes has become an increasingly important, even dominant, area of ESP. Secondly, the work of discourse and genre analysis on the one hand and the results of computer-based analysis on the other provide a fuller understanding of how specific texts, both written and spoken, work. It provides an update of these major developments in ESP and a summary of where the discipline is now. 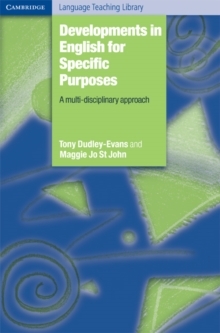 It is practical and accessible while covering a wide range of both theoretical and methodological topics. It also charts how ESP has been influenced by new ideas in the areas of management training, human resource development, sociology and intercultural training.